Doing this manually is really tedious. My question is thus: Is there an efficient way to export one or several specific objects within an SVG file at multiple resolutions from within Inkscape? Note: I have hacked together a working, scripted solution that invokes svg-objects-export multiple times, but it is very slow and inconvenient, because I need to adapt the script every time I add an asset to the SVG file. Ideally, I'm looking for a solution from within Inkscape ("Click and export", possibly for multiple selected objects at once). If that's not possible I'll take the next best option. A command line solution would be fine, as long as it's fast and automatically exports all assets in a file. For quality reasons, I am also not looking for a solution to scale down exported PNGs. 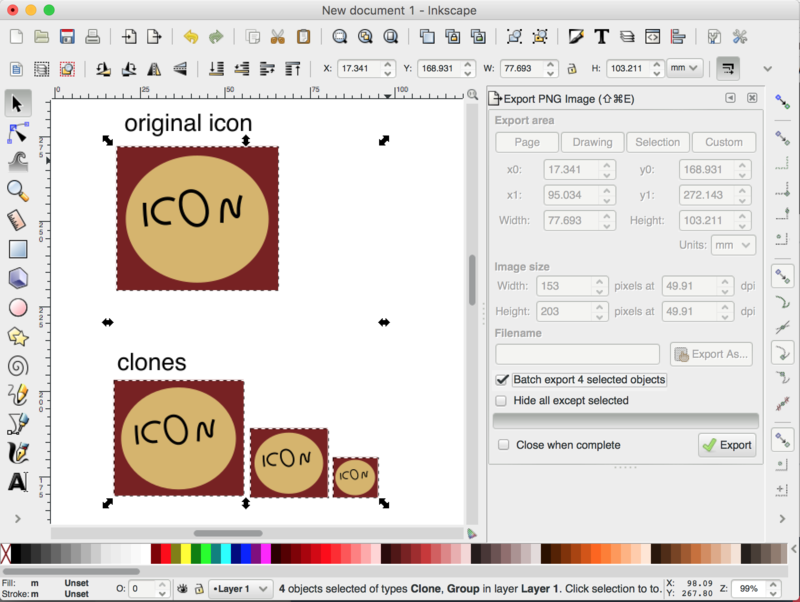 Create clones of your icons for each of the addition sizes you want to export. Give them ID:s in Object Properties and use the batch export option to save all of them in one click. Check out this tool https://github.com/redwarp/9-patch-resizer It will automatically resize .png files into several densities. Not the answer you're looking for? Browse other questions tagged vector inkscape svg export png or ask your own question. Illustrator exporting SVG, viewbox doesn't match artboard size?